While the kidneys operate to maintain osmotic balance and blood pressure in the body, they also act in concert with hormones. Hormones are small molecules that act as messengers within the body. Hormones are typically secreted from one cell and travel in the bloodstream to affect a target cell in another portion of the body. Different regions of the nephron bear specialized cells that have receptors to respond to chemical messengers and hormones. Table 22.1 summarizes the hormones that control the osmoregulatory functions. 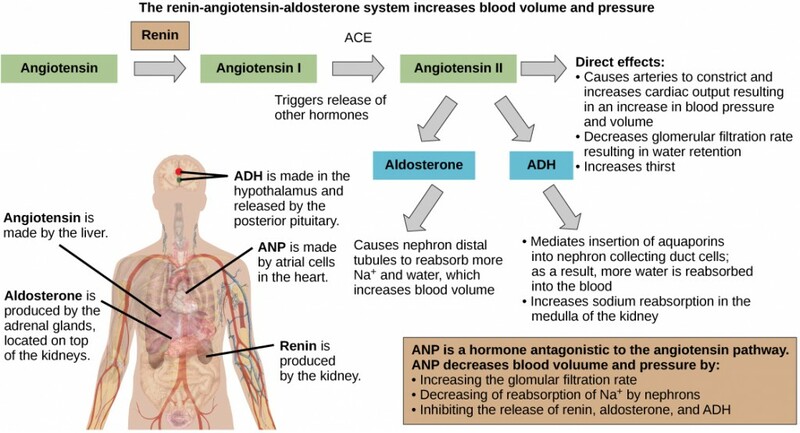 The renin-angiotensin-aldosterone system, illustrated in Figure 22.15 proceeds through several steps to produce angiotensin II, which acts to stabilize blood pressure and volume. Renin (secreted by a part of the juxtaglomerular complex) is produced by the granular cells of the afferent and efferent arterioles. Thus, the kidneys control blood pressure and volume directly. Renin acts on angiotensinogen, which is made in the liver and converts it to angiotensin I. Angiotensin converting enzyme (ACE) converts angiotensin I to angiotensin II. Angiotensin II raises blood pressure by constricting blood vessels. It also triggers the release of the mineralocorticoid aldosterone from the adrenal cortex, which in turn stimulates the renal tubules to reabsorb more sodium. Angiotensin II also triggers the release of anti-diuretic hormone (ADH) from the hypothalamus, leading to water retention in the kidneys. It acts directly on the nephrons and decreases glomerular filtration rate. Medically, blood pressure can be controlled by drugs that inhibit ACE (called ACE inhibitors). 22.5. Hormonal Control of Osmoregulatory Functions by Charles Molnar and Jane Gair is licensed under a Creative Commons Attribution 4.0 International License, except where otherwise noted.